Celebrating the life of Antonio Mora Silva, Jr.
Obituary for Antonio Mora Silva, Jr.
Mr. Antonio Mora Silva, Jr., resident of Dimmitt, Texas passed away Wednesdy, December 5 at the age of 68. Antonio was born on July 26th, 1950 in San Saba County, Texas to Antonio H. Silva and Jesusa Mora. Antonio is preceded in death by his parents and his brother David Silva. He leaves behind his 13 brothers and sisters: Connie and Manuel Martinez of Dimmitt, Texas, Guadalupe “Wally” and Carol Silva of Amarillo, Texas, Irene and Eddie Cavazos of Dimmitt, Texas, San Juanita Silva of Amarillo, Texas, Rosalinda Flores of Dimmitt, Texas, Rosanna and Fernando Davila of Houston, Texas, Isabel and Frank Gallardo of Slaton, Texas, Alma Silva of San Antonio, Texas, Angie and Ray Sandoval of Amarillo, Texas, Anita Romero of Amarillo, Texas, Adela and Mario Jacinto of San Antonio, Texas, Eduardo Silva of Dimmitt, Texas, and Louisa and Adam Dominguez of Amarillo, Texas. 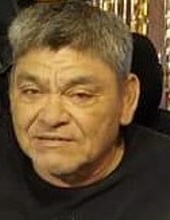 Antonio also leaves behinds his sons David Silva of Amarillo, Texas and Antonio Silva III of Pampa, Texas, as well as five grandchildren, numerous nieces, nephews, cousins, and friends all of whom love and will miss him greatly. "Email Address" would like to share the life celebration of Antonio Mora Silva, Jr.. Click on the "link" to go to share a favorite memory or leave a condolence message for the family.